Intellectual disability disorder (ID) is generally characterized as a deficit in a person’s mental ability. These deficits are wide-ranging, from reasoning and judgment to experiential learning and adaptive functioning. The struggle to meet such developmental standards affects one’s ability to cultivate appropriate social responsibility and personal independence. Supported residential living plans are flexible and adaptable to meet the changing abilities, pursuits, preferences, and needs of each individual. Adults with varying forms of intellectual disabilities find hope, encouragement, and support at The Brambles. 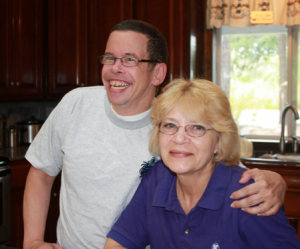 The Brambles’ residential living program for adults with intellectual disabilities is overseen by professional, caring staff, managers and nurses all focused on encouraging self-determination, independence, and quality of life. Custom-designed, handicap accessible facilities provide a safe haven for residents to develop and flourish to their greatest capacity. At The Brambles, we encourage residents with intellectual disabilities to live with as much freedom and autonomy as they wish. Our residential living support services enable adults with various types of intellectual disabilities to live the highest quality of life possible. You may download a brochure to find additional details on our day services and residential living program for intellectually disabled adults. Contact us for more information on The Brambles adult residential homes or to schedule a tour.